Have you been following along as we have been all over the country with our “See the USA” series? We have been exploring the United States as we make our way through the alphabet. This week we have arrived at the letter T and Traverse City, Michigan. Hopefully you caught the best of Seattle last week and Richmond, Virginia the week before. This week I have fellow Chicagoan Francesca from The Working Mom’s Travels sharing the top 5 family friendly things to do in Traverse City, Michigan one of the greatest places to explore in the Midwest! Traverse City is a town of approximately 15,000 in northwestern Michigan. 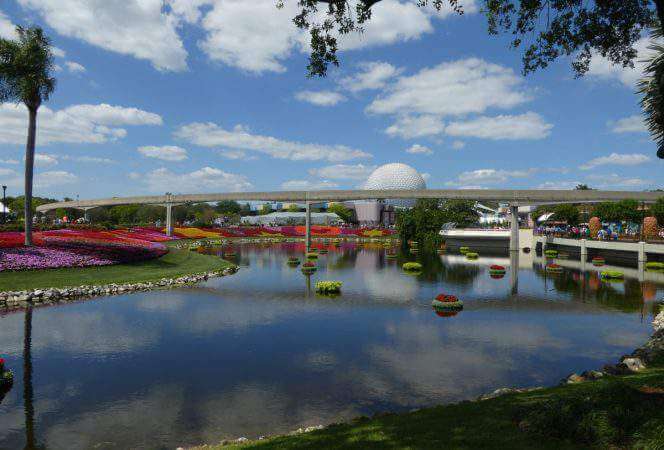 The area is a popular year-round vacation spot for Michiganders and Midwesterners, and in recent years, it’s gained increased nationwide notoriety. With its advantageous position on the shores of Grand Traverse Bay, Traverse City is the outdoor and nature lover’s dream. 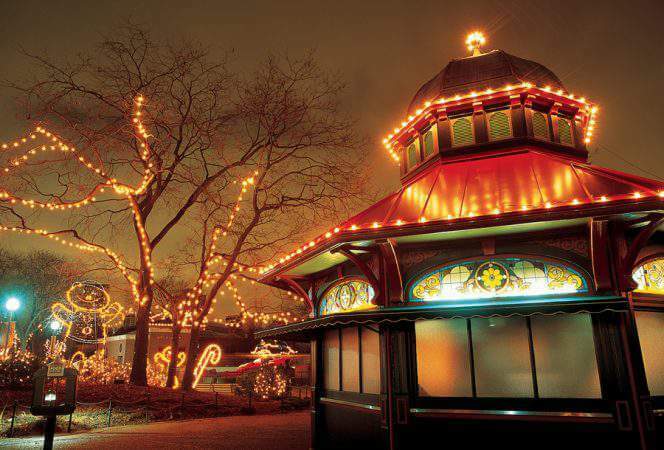 In addition, there is abundant history and culture, as well as robust dining and craft beverage scenes. There is plenty of room left for family fun, and the following are my top 5 picks for family-friendly things to do in and around Traverse City, Michigan. Traverse City and Sleeping Bear Dunes have become almost synonymous in recent years. The National Lakeshore is actually about 30 miles from Traverse City but you can’t visit the area and NOT go to Sleeping Bear Dunes. Standing atop the 450-foot bluffs above Lake Michigan, it’s easy to forget that you’re in the Midwest. The deep blue expanse extending beyond the shore resembles a deep ocean more than one of the Great Lakes. The National Park Service unit traces its roots back to early Native American cultures; today, visitors are invited to enjoy the natural beauty, 100 miles of hiking trails, northern hardwood and conifer forests, inland lakes, and abandoned farmsteads. Traverse City sits at the base of two peninsulas: Leelanau and Old Mission. At the very tip of Leelanau Peninsula, in Leelanau State Park, is Grand Traverse Lighthouse. Built in 1852, Grand Traverse Lighthouse is listed in the National Register of Historic Places. Visitors may take a self-guided tour through the living quarters of the lighthouse, which looks much the same as it did a century ago when it was occupied by its keeper and his family. 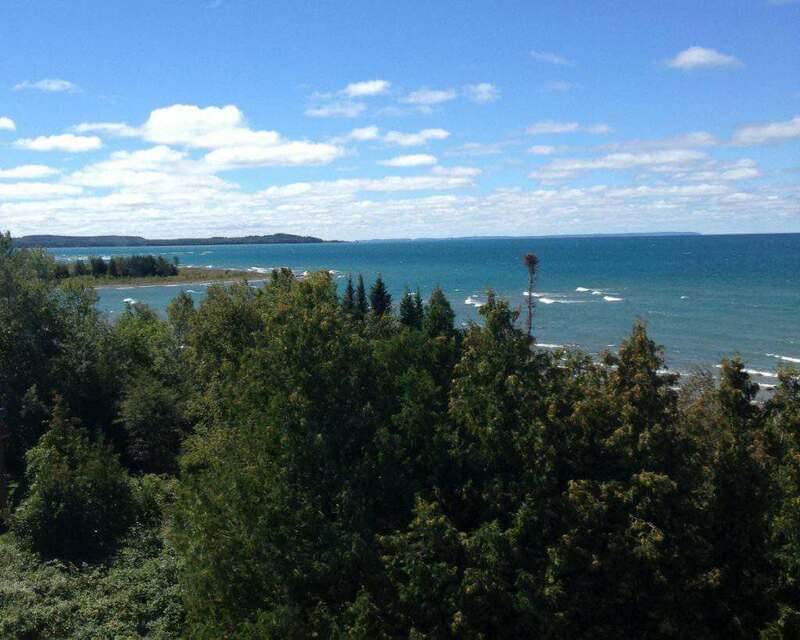 On the upper level of the lighthouse is a short but steep ladder which leads to the top and to spectacular views of Lake Michigan and Grand Traverse Bay. As mentioned above, the Traverse City area is a hot destination for craft beverage lovers. Of-drinking-age adults can spend days sampling all the wine, beer, and distilled liquors crafted in the region. Thanks to Cherry Republic, the kids are not to be left out of the beverage-tasting. 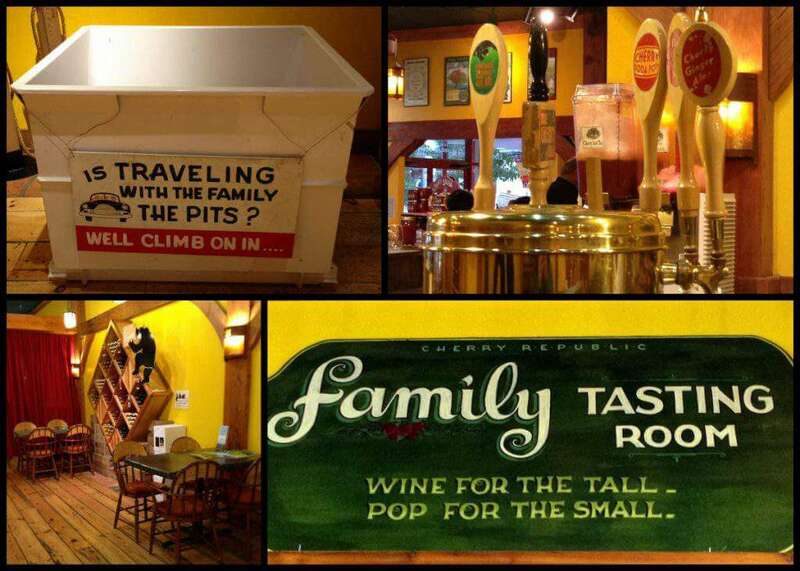 There is a Family Tasting Room, complete with soda taps and a “bartender”, where children of all ages can sample Cherry Republic’s homemade sodas. It’s comical to watch kids try to imitate the adults, taking small sips, swirling the beverages around, and deciding which sodas they like best. A note to parents about Cherry Republic’s sodas: they’re all made with pure Michigan beet sugar and are caffeine-free. Take a trip back in time with a visit to historic Fishtown. 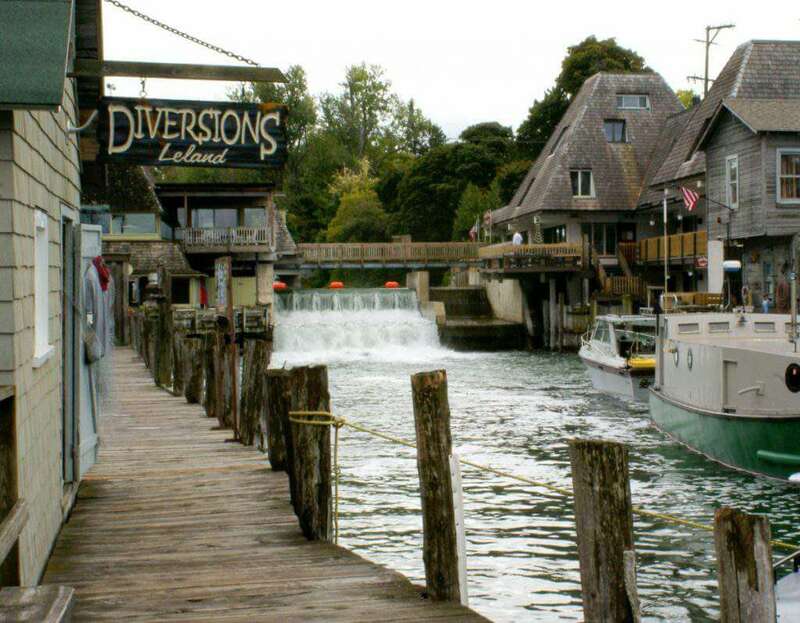 Located in the town of Leland (on Leelanau Peninsula), Fishtown is a collection of fishing shanties, docks, and smokehouses dating back 150 years. A visit to Fishtown is a living history lesson and one in preservation. It’s still a working waterfront and remains one of the last non-commercialized fishing harbors in all of Michigan. For the anglers in the family, Fishtown is a prime spot to catch a fishing charter out onto Lake Michigan for Chinook and Coho salmon. Traverse City is a four-season adventure destination. No matter the time of year, there is abundant outdoor fun to be had. Summer is quite possibly the prettiest season of all, allowing visitors to be out on the water kayaking, canoeing, or stand-up paddleboarding (SUP). The next best season is, undoubtedly, fall. 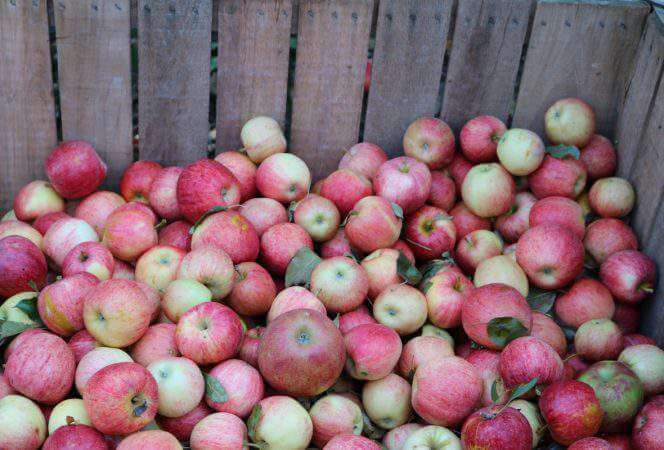 The foliage rivals the more famous New England destinations, and families love visiting the area’s many orchards and farms for apple-picking and hayrides. Winter is glorious around Traverse City and snow-sports enthusiasts flock there to ski, snowshoe, and snowmobile. Like much of the Midwest, spring weather can be a bit iffy. Families can find indoor fun at area museums, like the Great Lake Children’s Museum. Francesca Mazurkiewicz is a Chicago-based travel blogger and working mom of two. Via her blog, The Working Mom’s Travels, Francesca aims to show that working parents can still enjoy what they fancy in life, even after having kids. For Francesca, it is travel – with and without her family – music, and premium beverages, including craft beer and bourbon.